Plumbing Repair | Brooks Plumbing Co.
Of course, the sound of constant dripping can be quite annoying, but isn’t easier to just tune it out? It may be easy to brush off as “no big deal”, however, a leaky kitchen sink is never something to ignore. Your kitchen sink is pushed to its limits every day, and we often take for granted just how much it can endure. You utilize it for everyday washing, cooking, cleaning, and drinking, making it the most used faucet in your home. But, this repeated use can quickly create problems in the faucet mechanism, leading to a problematic drip. If your kitchen faucet is leaking, do not hesitate to contact a professional plumber in Yelm. A leaky kitchen sink can lead to serious problems, including water damage to your home and property. Plus, any leak is extremely wasteful, which can cause monthly water bills to sky-rocket. In case you aren’t yet convinced, we have outlined some of the reasons why you need to call a plumber ASAP. Keep reading below to learn more. Unexpected low water pressure has to be among the most frustrating problems for a homeowner to face. After all, when the water pressure is subpar, so too is your ability to shower effectively, do your dishes, or perform any daily task that requires a pressurized stream of water. Naturally, you want to get to the bottom of your low water pressure problem. The good news is, there might be a simple fix. Keep reading to learn if your water pressure trouble is a simple repair you can do on your own, or if it’s time to call a professional Olympia plumbing repair technician. We are standing by and ready to help! 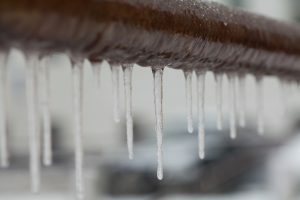 We get our share of cold weather here in Olympia, WA every winter, and one of the biggest problems that can cause is frozen pipes. Water expands when it freezes, and if that water is in your plumbing system, it can create tremendous pressure on the pipes. Burst pipes can be a catastrophe if they aren’t dealt with quickly, and even if you react to them immediately, they will still incur a great deal of hassle and expense getting them fixed. It’s better to simply prevent the problem in the first place, and with temperatures still relatively warm, now is the time to do it. Here are 3 ways to stop frozen pipes in their tracks. Plumbing problems are part and parcel of owning a home, and here in Olympia, WA, there are plenty of homeowners who may want to save a few pennies by performing repairs themselves, perhaps with the aid of an over-the-counter solution. In most cases, however, this can be a big mistake. Anytime you attempt to repair a plumbing problem yourself, you invite a whole host of larger issues that could turn a simple operation into a huge headache. Here are 3 good reasons to call in a plumber on any issue with your pipes, no matter how minor. Modern pipes in your home are built to last, especially here in Olympia, WA where our wet weather demands rugged materials for home-building. But when the water pressure in them gets too high, even they might not be able to stand it. The plumbing in most homes is built to withstand water pressure of 80 psi (pounds per square inch) or lower, but the civic water services can sometimes increase that pressure to higher amounts. Hot water tends to exert more pressure as well, since heat expands the water and there’s only so far it can go in the pipes. As you may suspect, this can cause some serious damage. The good news is that there’s ways to prevent it with a little help from a qualified plumber. We’re used to doing things on our own here in Olympia, WA. That often extends to plumbing problems, which many people feel they can solve themselves with store-bought tools. Nothing can be further from the truth. Homeowners hoping to perform repairs themselves often cause more damage than they solve, and can turn relatively minor problems into very large ones. Here are 3 reasons not to repair your own plumbing, which you should seriously consider before climbing under your sink. The advent of copper as the main material for plumbing pipes was a major upset in the industry in the mid-twentieth century. Prior to the widespread use of copper, plumbing pipes were mainly composed of lead or iron. Iron, of course, was extremely susceptible to rupturing from rust. Lead, meanwhile, was flat out poisonous. Copper piping, on the other hand, is almost immune to the types of corrosion that plagued its predecessors. The key word there is “almost.” There is one type of corrosion that can still affect copper pipes, and it can cause all sorts of damage to your plumbing and home. Let’s take a look at pitted corrosion, and the pinhole leaks it causes. Pitted corrosion is a type of corrosion that degrades copper pipes from the outside inward. The corrosion is always focused in a very small area, allowing it to eat through the pipe more quickly. Eventually, it opens up a tiny hole in the pipe. This hole is called a “pinhole leak” because of its small size. Pinhole leaks are only large enough to leak one or two drops at a time, so you might think that they’re not that big of a deal. Unfortunately, they can inflict damage far beyond their small size. With most plumbing issues, like pipe blockages or ruptures, there are symptoms that the homeowner can detect. Sudden changes in water pressure, discoloration, and other signs serve to warn the homeowner that something is wrong with the plumbing system. Pinhole leaks are so small, however, that they don’t cause any detectable symptoms. This means that the first warning a homeowner usually gets that a pinhole leak is present is when they come across the damage that leak has already caused. Most of the plumbing pipes in your home are installed in the walls, surrounded by insulation, sheet rock, and support studs. Over a long enough period of time, even the slow drip of water from a pinhole leak can rot out the area around it. By the time a homeowner notices the damage that the pinhole leak has caused, it’s too late. The best way to counter pinhole leaks is to have your plumbing inspected by a professional at least once a year. If you haven’t had your home’s plumbing inspected in a while, call Brooks Plumbing. We provide plumbing services throughout Olympia. 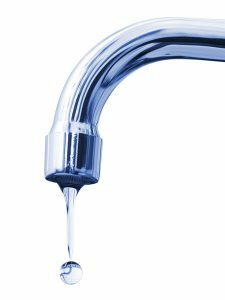 Posted in Plumbing | Comments Off on What Is a Pinhole Leak? Since the advent of copper pipes in the mid-twentieth century as the primary plumbing material, the life expectancy for plumbing systems has increased to almost 100 years. This newfound resilience has been a great gift to homeowners, who don’t have to worry about their pipes rusting out from under them anymore. Copper pipes are not immune to all damage, however, and there are still plenty of older homes that don’t use copper pipes. Let’s take a look at some of the signs that you need to replace your water line. 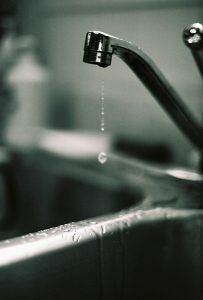 Common in homes with iron, steel, or lead pipes. If you notice red or brown water coming out of your faucets, it’s a sign of advanced oxidization somewhere in your plumbing system. Rust that is this advanced is dangerous, because it increases the chance that a pipe will rupture. If you see discoloration in your water, call a plumber right away. Honestly, if you know that you have an older pipe system, especially if it’s lead, you should probably replace your pipes anyway. A loss of water pressure can be caused by a number of plumbing issues, one of which is a leak or blockage in your home’s water line. Obviously, neither of those things is good for the health of your system. Depending on the size of the leak (or blockage) it may be possible to repair the issue without replacing the line. However, it is often less expensive to simply replace the water line. While most of your home’s plumbing is installed out of sight, there are many homes that have water lines that are at least partially visible. If you have any part of your plumbing system that can be visually inspected, make a habit of doing so at least once a year. You’ll want to look for any signs of corrosion, which often manifests as a white, chalky substance on the pipes. Depending on how widespread the corrosion is, you may have to replace the water line. Copper pipes are vulnerable to this condition, so be sure not to skip checking them as well. If you think you may need to replace your water line, call Brooks Plumbing. We provide plumbing repair throughout Tumwater. Leaky faucets can waste a great deal of water and if left to drip for a long period of time, can erode and/or rust the area on which it is dripping. You can check the faucet aerator yourself by unscrewing it; if there is debris in the aerator, wash it out and screw the aerator back on. If your faucet continues leaking, call for an expert. It isn’t unusual for food to lodge in your kitchen sink, or for grease to build-up inside the piping. These things and other issues can cause your kitchen sink to clog. You can try to plunge your sink, but if that doesn’t resolve the problem, call for help. Note: do NOT use chemical drain cleaners. These products have very harsh chemical that can damage your plumbing and many times do not resolve the issue. Garbage disposal can be misused, with items like plastic and glass being flushed down the sink. Garbage disposals are not for garbage; they are made to reduce food waste only, so only food should be washed into them. Most garbage disposals have a reset button on the motor, so if your disposal isn’t working, you try that first. If your disposal still doesn’t work after pressing the reset button, it’s best to call for assistance. Trained and experienced plumbers have the right tools, knowledge and expertise to fix your plumbing problems quickly, correctly and efficiently. If you are experiencing problems with your kitchen sink, or have any other kind of plumbing problem, call Brooks Plumbing today and schedule plumbing repair in Olympia with one of our expert plumbers.